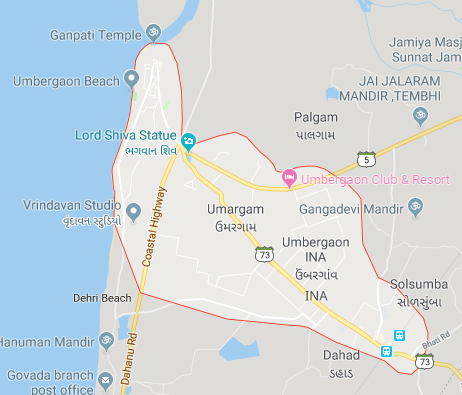 Umargam assembly constituency (ઉમરગામ વિધાનસભા બેઠક) .182 Umbergaon (ST) is a State Assembly/Vidhan Sabha constituency in the Valsad district and South Gujarat region of Gujarat and is a part of the Valsad (ST) Parliamentary/Lok Sabha constituency. As of 2017 There are a total of 243340 voters in the constituency, of which 130017 are male, 113323 female and 0 others.This seat is reserved for a member of the Scheduled tribes. Umbergaon constituency recorded a voter turnout of 64.41% in the 2017 Gujarat Assembly Elections and the polling for this seat was held on December 9, 2017 in Phase 1 of the elections.